Adding a pergola to your home or garden can provide your property with a visually distinctive feature that helps it stand out from the crowd. Pergolas provide cooling shade without completely blocking sunlight and can make the perfect home for attractive climbing plants and vines. Modern Exteriors of Springfield is proud to offer high-quality pergolas to homeowners throughout our region, and will be happy to help you find a pergola to suit your unique needs. These pergola covers are available with a range of options, making it easy to find one that matches your home. You can choose from multiple sizes, two different colors and three different column designs, all of which are inspired by Italian architecture. These pergolas are available for direct attachment to your home, for freestanding construction over your patio or as a standalone garden arbor. 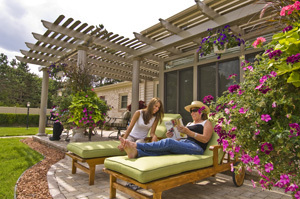 When you visit Modern Exteriors’ showroom, you can view our pergola patio enclosures up close and receive professional assistance from our consultants to determine the ideal option for you. When it comes time to install your pergola, Modern Exterior’s professional team will be there to assist from start to finish. Our highly skilled exterior improvement technicians all receive factory training from TEMO, ensuring they know how to install these pergola systems with exceptional precision. For more information about our selection of TEMO pergola systems for homes in Joplin, MO; Nixa, MO; Marshfield, MO; Mountain Home, AR and all nearby cities, contact us today. We also proudly offer sunroom systems, home siding, deck products, vinyl replacement windows, guttering and many other exterior home improvement products.